The opening day of the International G-8 Open Data for Agriculture conference was packed with inspiring examples of creating, sharing and using data in agriculture globally. Despite the rain in Washington, DC, attendees arrived early and packed the house. Thank you to all of the virtual participants, as well. There has been a steady stream of Tweets and click-throughs to various digital resources that have made this a truly global event. We wanted to share several updates and resources from Day 1 in case you missed anything. Remember to follow along on Twitter with #OpenAgData and add your own comments or questions. We created a G8 #OpenAgData Twitter List with participants and attendees to follow, as well. 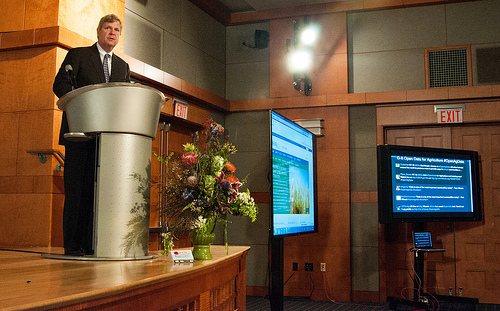 Agriculture Secretary Tom Vilsack announced the Food, Agriculture, and Rural Community on Data.gov. The virtual community offers a catalog of over 300 data sets as well as numerous apps, tools and statistical products. Our Day 1 Storify Board includes info from each session and a collection of resources. Check back for updates, and tomorrow we will start a new board for Day 2. Don't worry, we'll make sure to add a link to each board. Tune in Tuesday, April 30, 2013 at 8:30 am ET for the second and final day of the G-8 Open Data for Agriculture Conference. Visit the conference website to view the complete schedule, participate biographies and to share your ideas about what food security challenges you could clove with open access to data.